EFTA Surveillance Authority requires Norway to take the measures necessary to comply with this reasoned opinion within two months of its receipt. By letter dated 22 July 2014 (Doc. 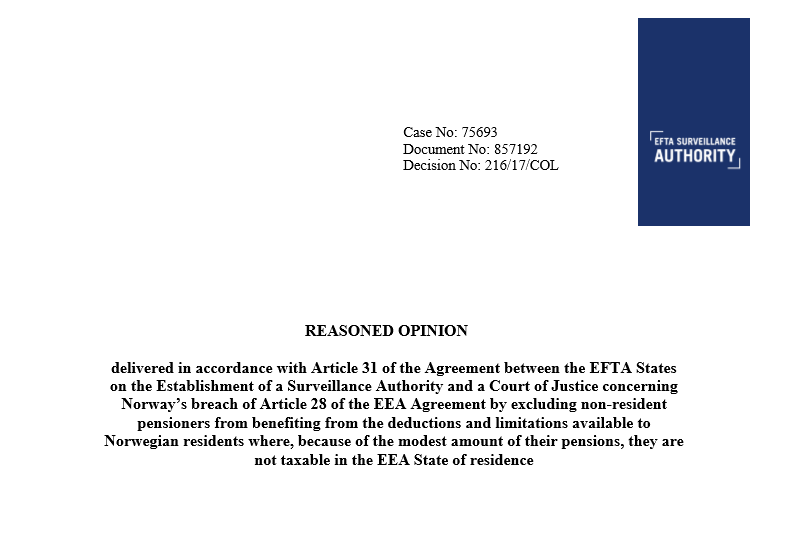 No 715012), the EFTA Surveillance Authority (“the Authority”) informed the Norwegian Government that after delivery of the judgment in Case E-26/13 Gunnarsson1, it had resumed the examination of the issues concerning taxation by Norway of pensions received by persons residing in the other EEA States. 2. In the course of the examination of the issues, it appeared that Norway does not respect the principles established by the Court of Justice of the European Union (“the Court of Justice”) in its judgment of 10 May 2012, Commission v Estonia, C-39/102. 3. This judgment established, in essence, that Article 45 TFEU and Article 28 EEA prohibit national provisions under which non-resident pensioners are excluded from benefiting from the threshold below which the taxpayer is regarded as not having the necessary means to finance public expenditure, where, because of the modest amount of their pensions, they are not taxable in the EEA State of residence under the tax legislation of that State. 4. On 3 December 2015, the Authority received a complaint of a pensioner living in another EEA State and receiving a low Norwegian old-age pension (Case No 78352). Norway is taxing the pension with a withholding tax of 15 %. However, according to the complaint, Norwegian residents receiving such low pensions are exempted from taxes in Norway. The complainant claims to not being taxed in the State of residence because of the modest amount of his pension. On 9 December 2015, the Authority informed the Norwegian Government about the complaint (Doc. No 784032). 5. In this reasoned opinion, the Authority maintains its conclusions set out in the letter of formal notice of 8 February 2017 (Doc. No 827905) that by excluding non-resident pensioners from benefiting from the deductions and limitations available to Norwegian residents where, because of the modest amount of their pensions, they are not taxable in the EEA State of residence Norway is in breach of Article 28 EEA. By the letter of 22 July 2014, referred to in paragraph 1 above, the Authority requested information from the Norwegian Government regarding the Norwegian tax rules applicable to pension payments from Norwegian sources paid to non-resident persons. 7. After an extension of the deadline, the Norwegian Government responded by letter of 3 October 2014 (ref. 14/3589-jr, Doc. No 724696). 8. The case was discussed at the package meeting in Norway on 16 and 17 October 20143. 9. On 28 August 2015, the Authority’s Internal Market Affairs Directorate sent a Pre-Article 31 letter (Doc. No 751501) to Norway. 10. The reply from the Norwegian Government to the Pre-Article 31 letter was received on 5 October 2015 (ref. 14/3589, Doc. No 775786). 1 Case E-26/13 Gunnarsson  EFTA Ct. Rep. 254. 2 Judgment of 10 May 2012, Commission v Estonia, C-39/10, EU:C:2012:282. 3 See the follow-up letter to the package meeting (Case No 75236, Doc. No 726564). The case was further discussed with Norway at the package meetings of 12 and 13 November 20154 and 27 and 28 October 20165. 12. On 8 February 2017, the Authority issued a letter of formal notice to Norway in which it considered that by excluding non-resident pensioners, with the exception of those who receive the whole or almost the whole income from Norwegian sources, from benefiting from the deductions and limitations available to Norwegian residents, such as the deductions and limitations referred to in Sections 6-30 to 6-32, 6-40, 15-4, 16-1 and 17-1 of the Tax Act, where, because of the modest amount of their pensions, they are not taxable in the EEA State of residence under the tax legislation of that State, Norway has failed to fulfil its obligations arising from Article 28 EEA. 13. By letter of 16 March 2017 (ref. 14/3589-9, Doc. No 847900), the Norwegian Government asked the Authority to disclose the identity of the complainant in Case No 78352 and his state of residence. 14. By letter of 20 March 2017 (Doc. No 847991), the Authority disclosed the identity of the complainant to the Norwegian Government. In this letter, it also specified that it did not consider the letter from the Norwegian Government of 16 March 2017 as a reply to the letter of formal notice. 15. After an extension of the deadline, Norway replied to the letter of formal notice on 11 May 2017 (ref. 14/3589, Doc. No 856009). 16. The case was discussed with the Norwegian Government at the package meeting of 26 and 27 October 20176. For the account of the relevant national and EEA law, the Authority refers to Part 3 and Part 4 respectively of the letter of formal notice. 4 See the follow-up letter to the meeting (Case No 77692, Doc. No 781498). 5 See the follow-up letter to the meeting (Case No 79432, Doc. No 824382). 6 See the follow-up letter to the meeting (Case No 80900, Doc. No 878916). 7 See, inter alia, judgment of 10 May 2012, Commission v Estonia, C-39/10, EU:C:2012:282, paragraph 47 and the case law cited therein. consistently with the freedoms guaranteed by the EEA Agreement, in particular, the freedom of movement for workers, as conferred by Article 28 EEA abolishing any discrimination based on nationality. 20. According to established case law, discrimination can arise through the application of different rules to comparable situations or the application of the same rule to different situations8. 21. As far as direct taxes are concerned, residents and non-residents are generally not in comparable situations, since the income received in the territory of an EEA State by a non-resident is in most cases only a part of his total income, which is concentrated at his place of residence, and a non-resident’s personal ability to pay tax, determined by reference to his aggregate income and his personal and family circumstances, is easier to assess at the place where his personal and financial interests are centred, which is generally the place of his usual residence9. 22. The Court of Justice held in the judgment of 14 February 1995, Schumacker, C-279/93,10 that the fact that a Member State does not grant to a non-resident certain tax advantages which it grants to a resident is not, as a rule, discriminatory, having regard to the objective differences between the situations of residents and nonresidents from the point of view both of the source of their income and of their personal ability to pay tax or their personal and family circumstances11. 23. There could be discrimination within the meaning of the EEA Agreement between residents and non-residents only if, notwithstanding their residence in the different EEA States, it were established that having regard to the purpose and content of the national provisions in question, the two categories of taxpayers are in a comparable situation12. 24. That is the case where a non-resident, who has no significant income in his EEA State of residence gains the main part of his taxable income from an activity carried on in the EEA State of employment. Such a non-resident is in a comparable situation to that of residents of the latter State, because the EEA State of residence is not in a position to grant him the advantages resulting from the taking into account of his personal and family circumstances. Consequently, as regards his tax treatment, he must be treated as resident in the EEA State of employment, and that State must grant him the tax advantages it allows to residents13. 25. The Court of Justice has also held in the judgment of 1 July 2004, Wallentin, C-169/03, that, in a situation in which there is no taxable income in the EEA State of residence under the tax legislation of that State, discrimination could arise if the personal and family circumstances of a person such as the complainant, in that case, were taken into account neither in the EEA State of residence nor in the EEA State of employment14. 8 See, inter alia, judgment of 10 May 2012, Commission v Estonia, C-39/10, EU:C:2012:282, paragraph 48 and the case law cited therein. 9 See, inter alia, judgment of 10 May 2012, Commission v Estonia, C-39/10, EU:C:2012:282, paragraph 49 and the case law cited therein. See also to this effect Case E-26/13 Gunnarsson, cited above, paragraph 86. 10 Judgment of 14 February 1995, Schumacker, C-279/93, EU:C:1995:31, paragraph 34. 11 See judgment of 10 May 2012, Commission v Estonia, C-39/10, EU:C:2012:282, paragraph 50 and the case law cited therein. 12 See judgment of 10 May 2012, Commission v Estonia, C-39/10, EU:C:2012:282, paragraph 51 and the case law cited therein. 13 See judgment of 10 May 2012, Commission v Estonia, C-39/10, EU:C:2012:282, paragraph 52 and the case law cited therein. See also Case E-26/13 Gunnarsson, cited above, paragraph 87. 14 Judgment of 1 July 2004, Wallentin, C-169/03, EU:C:2004:403, paragraph 17. Moreover, in a case where a person, because of the modest amount of worldwide income is not taxable in the EEA State of residence, under that State’s tax legislation, that State is not in a position to take into account the ability to pay tax and the personal and family circumstances of the person concerned, in particular the consequences for that person of taxation of the income received in another EEA State15. 27. In those circumstances, the refusal of the EEA State in which the income in question is received to grant an allowance provided for under its tax legislation penalises non-resident taxpayers simply because they have exercised the freedoms of movement guaranteed by the EEA Agreement16. 28. The Norwegian provisions establish that only non-residents receiving the whole or almost the whole income from Norwegian sources may be entitled to deductions and limitations available to Norwegian residents, such as the deductions and limitations referred to in paragraphs 14-17 of the letter of formal notice. Therefore, in a situation such as assessed in the judgment of 10 May 2012, Commission v Estonia, C-39/10, the Norwegian rules would not allow the deductions and limitations at issue to be applied. 29. The difference of treatment between residents and non-residents resulting from such legislation can only be justified if it is based on objective considerations proportionate to a legitimate aim pursued by the national provisions17. 30. The Norwegian Government has not expressly advanced any justifications for the national provisions at issue. In the reply to the letter of formal notice, the Norwegian Government argued extensively against the Authority’s conclusion reiterated in paragraph 18 above, although the information provided in the reply appears to go beyond the actual scope of the issue addressed in the current infringement procedure. Thus, in Parts 3, 5 and 6 of the reply, in particular, the Norwegian Government provides quite detailed explanations of various aspects of the Norwegian tax system and its application to pensions in different situations, without, however, providing clear legal argument or justification in these sections for the infringement identified in the letter of formal notice. 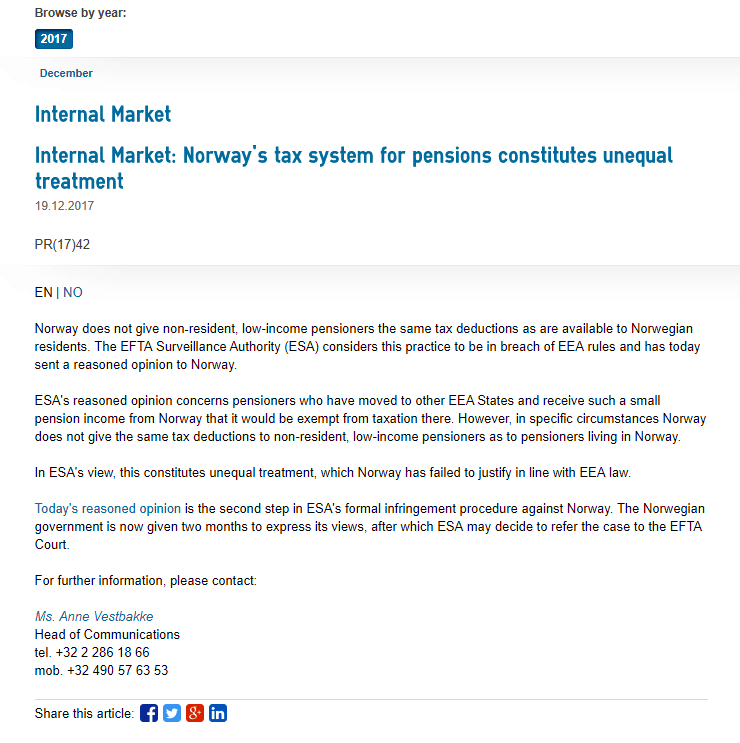 In this regard, the Authority would like to emphasise that the scope of this procedure is limited to situations where non-resident pensioners are not taxable in the EEA State of residence under the tax legislation of that State because of the modest amount of their pensions, but, nevertheless, are subject to a withholding tax of 15 % in Norway. In the sections below, the Authority will proceed, whilst taking note of the descriptive elements in the reply, to discuss the arguments advanced both explicitly and implicitly by Norway. 15 See judgment of 10 May 2012, Commission v Estonia, C-39/10, EU:C:2012:282, paragraph 55. 16 See judgment of 10 May 2012, Commission v Estonia, C-39/10, EU:C:2012:282, paragraph 56. 17 See judgment of 10 May 2012, Commission v Estonia, C-39/10, EU:C:2012:282, paragraph 57 and the case law cited therein. In Part 1 of the reply (“EEA law”), the Norwegian Government maintains, in essence, that the interpretation of the EEA Agreement, including its Article 28 first paragraph, must respect the international law principles on treaty interpretation and that those principles do not support the interpretation advanced by the Authority in the letter of formal notice. 33. However, it has to be noted, as regards the international law principles on treaty interpretation, that the EEA Agreement is an international treaty sui generis which contains a distinct legal order of its own. The depth of integration of the EEA Agreement is less far-reaching than under the EC Treaty, but the scope and the objective of the EEA Agreement go beyond what is usual for an agreement under public international law18. This legal order as established by the EEA Agreement is characterised by the creation of an internal market, the protection of the rights of individuals and economic operators and an institutional framework providing for effective surveillance and judicial review19. In its case law, the EFTA Court has not followed the interpretation rules of the Vienna Convention on the Law of Treaties. 34. In addition, the Authority observes that according to Article 6 EEA the provisions of the EEA Agreement, in so far as they are identical in substance to corresponding rules of EU law, shall be interpreted in conformity with the relevant rulings of the Court of Justice given prior to the date of signature of the EEA Agreement. The homogeneity objective of the EEA Agreement as expressed, inter alia, in Articles 1 EEA, 105 EEA and in the fourth and fifteenth recitals of the Preamble to the EEA Agreement obliges the Contracting Parties to arrive at as uniform an interpretation as possible of the provisions of the EEA Agreement and those provisions of EU legislation which are substantially reproduced in the EEA Agreement. 36. Reference is also made to the objective to ensure coherence of EEA law and the reciprocity of the rights of EEA EFTA and EU nationals and economic operators in the EU and EFTA pillars. It must be noted that reciprocity in this context is emphasised both by the EFTA Court20 and by the Court of Justice21. 37. There are, of course, differences in the scope and purpose of the EEA Agreement as compared to the Treaty on the Functioning of the European Union, and it cannot be ruled out that such differences may, under specific circumstances, lead to differences in the interpretation. However, where parallel provisions are to be interpreted without any such specific circumstances being present, homogeneity should prevail22. 38. 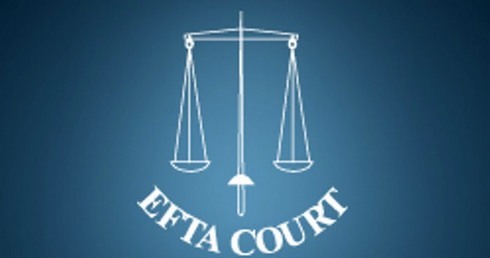 Furthermore, according to Article 3(2) of the Agreement between the EFTA States on establishment of a Surveillance Authority and a Court of Justice (“SCA”) the EFTA Court and the EFTA Surveillance Authority, in the interpretation and application of the EEA Agreement, are to pay due account to the principles laid down by the relevant rulings by the Court of Justice of the EU given after the date of signature of the EEA Agreement. 18 Case E-9/97 Sveinbjörnsdóttir  EFTA Ct. Rep. 95, paragraph 59. 19 Case E-2/03 Ásgeirsson  EFTA Ct. Rep. 185, paragraph 28. 20 See Case E-11/12 Koch  EFTA Ct. Rep. 272, paragraph 116; Case E-18/11 Irish Bank  EFTA Ct. Rep. 592, paragraphs 57 and 58; Case E-14/11 DB Schenker I  EFTA Ct. Rep. 1178, paragraph 118; Case E-3/12 Jonsson  EFTA Ct. Rep. 136, paragraph 60; Case E-12/13 ESA v Iceland  EFTA Ct. Rep. 58, paragraph 68. 21 See the Opinion of Advocate General Kokott in UK v Council, C-431/11, EU:C:2013:187, paragraph 42; and judgment of 26 September 2013, UK v Council, C-431/11, EU:C:2013:589, paragraph 55. 22 See, for example, Case E-3/98 Herbert Rainford-Towning  EFTA Ct. Rep. 205, paragraph 21. When interpreting EEA law the EFTA Court therefore widely uses the case law of the Court of Justice, irrespective of the fact whether it was adopted before or after the signing of the EEA Agreement. 40. There is, moreover, no indication in the case law of the EFTA Court that a difference is made between case law of the Court of Justice delivered before and after the signing of the EEA Agreement. 41. The Authority’s conclusion in the letter of formal notice, as well as in this reasoned opinion, refers to the breach by Norway of Article 28 EEA which is substantially identical to Article 45 TFEU. Therefore, the case law of the Court of Justice regarding Article 45 TFEU is to be applied mutatis mutandis to Article 28 EEA23. 42. Finally, as regards, in particular, the current infringement proceedings, it has to be noted that the judgment of 10 May 2012, Commission v Estonia, C-39/10, found Estonia to be in breach not only of Article 45 TFEU but also of Article 28 EEA. Part 1 of the reply (“EEA law”) also claims, in essence, first, that Article 28 EEA cannot be applicable to all pensioners living in another EEA State. Second, it cannot be applicable to pensions that are not work-related but are received in respect of the number of years a person has been resident in Norway after the age of 18. Finally, Article 28 EEA cannot be claimed to be applicable to a pension related to employment exercised long before there was an EEA Agreement. 44. As a preliminary point, the Authority notes that the approach of the Norwegian Government is based on an interpretation of the concept “worker” in Article 28 EEA using principles derived from international law and the Vienna Convention on the Law of Treaties. In that regard, it should be emphasised that according to the settled case law of the Court of Justice, the concept of “worker” within the meaning of Article 28 EEA has an autonomous meaning specific to EEA law and must not be interpreted narrowly24. This means also that its content cannot be determined unilaterally by the EEA States according to their national law25. 45. The Authority agrees that Article 28 EEA indeed does not apply to all pensioners living in another EEA State. For example, as can be seen from the judgment in Case E-26/13 Gunnarsson, persons who have carried out all their occupational activity in the EEA State of which they are nationals and have not exercised the right to reside in another Member State before their retirement cannot rely on the freedom guaranteed by Article 28 EEA. Rather, such persons are protected under Directive 2004/38/EC26 27. 23 See, to this effect, the judgment of 10 May 2012, Commission v Estonia, C-39/10, EU:C:2012:282, paragraph 67. 24 See, to that effect, judgment of 21 February 2013, L. N., C-46/12, EU:C:2013:97, paragraph 39 and the case law cited therein. 25 See judgment of 23 March 1982, Levin, 53/81, EU:C:1982:1035, paragraph 11. 26 Act referred to at point 3 of Annex VIII to the EEA Agreement (Directive 2004/38/EC of the European Parliament and of the Council of 29 April 2004 on the right of citizens of the Union and their family members to move and reside freely within the territory of the Member States amending Regulation (EEC) No 1612/68 and repealing Directives 64/221/EEC, 68/360/EEC, 72/194/EEC, 73/148/EEC, 75/34/EEC, 75/35/EEC, 90/364/EEC, 90/365/EEC and 93/96/EEC), as adapted to the EEA Agreement by Protocol 1 thereto. 27 Case E-26/13 Gunnarsson  EFTA Ct. Rep. 254, paragraph 82. However, individuals benefiting from Article 28 EEA, as well as Regulation No 492/201128, include not only current but also former workers. 47. In particular, according to settled case law, migrant workers are guaranteed certain rights linked to the status of a worker even when they are no longer in an employment relationship. That is the case in regard to benefits the payment of which is dependent on the prior existence of an employment relationship which has come to an end and is intrinsically linked to the recipients’ objective status as workers29. 48. In any case, the Norwegian provisions at issue in the current proceedings are clearly general by nature and applicable, inter alia, to situations falling within the scope of Article 28 EEA. In Part 2 of the reply (“The Norwegian domestic law”), the Norwegian Government claims that the Norwegian legislation gives a choice to remain a resident for taxation purposes in Norway even in case of final emigration. Therefore, Norway cannot be obliged to also give deductions to non-resident pensioners who have positively chosen to emigrate for taxation purposes – with all the consequences this choice has for the Norwegian taxation. 50. In that regard the Authority observes that in cases where non-resident pensioners have, for whatever reason, not availed themselves of the possibility to make use of the option to be treated as a Norwegian resident for tax purposes, the result will be that their pensions, unlike those of resident pensioners, will be subject to a withholding tax of 15 %. The mere availability of this option does not suffice to neutralise the inequality of treatment of resident and non-resident pensioners who from the point of view of taxation, are in comparable circumstances. As the Court of Justice ruled in its judgment of 18 March 2010, Gielen, C-440/08, the discriminatory effect of a specific provision cannot be eliminated simply by allowing EEA nationals to opt for a specific tax treatment, because, if such a choice were to be recognised as having the effect described, the consequence would be to validate a tax regime which, in itself, remains contrary to EEA law30. 51. In any case, the case law cited in Part 4.1 above, requires the EEA States to ensure equal treatment of residents and non-residents in the situations described therein, regardless of whether the person at issue has a possibility to elect to be treated as a Norwegian resident for tax purposes31. 28 Act referred to at point 2 of Annex V to the EEA Agreement (Regulation (EU) No 492/2011 of the European Parliament and of the Council of 5 April 2011 on freedom of movement for workers within the Union), as adapted to the EEA Agreement by Protocol 1 thereto. 29 See, inter alia, judgment of 11 September 2008, Petersen, C-228/07, EU:C:2008:494, paragraphs 48 and 49 and the case law cited therein. 30 The judgment of 18 March 2010, Gielen, C-440/08, EU:C:2010:148, paragraphs 49-55. 31 See, to this effect, in the field of the freedom of establishment, judgment of 9 February 2017, X, C-283/15, EU:C:2017:102, where the Court of Justice examined the issue of whether the Dutch national law should allow deducting negative income arising from a dwelling in another EEA State not only in situations where a person elected to be treated as a Dutch resident for tax purposes but also in cases where a taxpayer has not exercised that option. Part 4 of the reply (“Subsidising other countries‟ tax systems – „State aid‟”) argues that if Norway had to give deductions in cases such as those referred to by the Authority, it would lose control of its own taxing powers and the ability to decide how the tax system should be designed and, moreover, would be subsidising another country’s tax system. 53. The Authority does not see how Norway could lose control of its taxing powers by bringing its national law in compliance with EEA law. As already explained in paragraphs 42-45 of the letter of formal notice, the judgment of 10 May 2012, Commission v Estonia, C-39/10, does not require the EEA States to change their allocated taxation powers, but only to take into account the taxpayers’ worldwide income for the purposes of determining their ability to pay the tax from the income received in the source State where, because of the modest amount of their pensions, they are not taxable in the EEA State of residence under the tax legislation of that State. 54. Nor does the Authority see how permitting deductions in such situations would amount to subsidising the tax system of another EEA State – even indirectly ˗, as in the situations envisaged by the current infringement proceedings the persons at issue are not paying taxes in their state of residence anyway. In such cases, the state of residence will not enjoy any tax gain commensurate with the tax loss incurred by Norway. 55. In any case, it is settled case law that a loss of tax revenue can never be relied upon to justify a restriction on the exercise of a fundamental freedom32. In Part 5 of the reply (“The Norwegian withholding tax rate”), the Norwegian Government refers to the sizeable public funding of the Norwegian pension scheme and explains the need to retrieve, at least, part of the public subsidies by taxing the pensions. 57. To the extent that this argument can be understood as a justification for the disputed provisions, it does not, however, explain the inequality of treatment between resident and non-resident pensioners receiving low pensions. Indeed, it only serves to highlight the difference in treatment as only the non-resident recipients of modest pensions is required to contribute, through the withholding tax, to the partial recovery of the pension scheme subsidies. 32 The judgment of 12 December 2002, de Groot, C-385/00, EU:C:2002:750, paragraph 103 and the case law cited therein. See also, to this effect, Case E-1/04 Fokus Bank  EFTA Court Rep. 11, paragraph 33. 33 See, in this regard, judgment of 12 December 2013, Imfeld and Garcet, C-303/12, EU:C:2013:822, paragraph 41 and the case law cited therein. and cannot make the rights conferred by Article 28 EEA subject to the contents of a bilateral agreement concluded with another EEA State34. In Part 7 of the reply (“The Norwegian tax burden under the withholding tax regime compared to a regime allowing for deductions”), the Norwegian Government states, in essence, that the complainant in Case No 78352 would be taxed more heavily if Norway were to give him deductions. 61. Even if it was the case, as stated already in the Authority’s letter of 20 March 2017, the current infringement proceedings do not deal with the individual situation of the complainant but rather concerns the legislative framework in Norway in general which is not, as explained, in line with the obligations of the Norwegian Government under Article 28 EEA. In Part 7 (“The Norwegian tax burden under the withholding tax regime compared to a regime allowing for deductions”) and Part 8 (“Consequences to the Norwegian tax system for non-resident pensioners”) of the reply, the Norwegian Government claims that administratively it is very complex to operate three different regimes for non-resident EEA pensioners, i.e. full residence deductions for those with 90 percent or more of taxable income, proportionate deductions for those with less than 90 percent taxable income and a grass-based withholding system. Therefore, the “obvious alternative” in order to bring the national provisions in line with EEA law is to abolish the withholding tax system for EEA pensioners, abolish the rules giving full deductions to EEA pensioners who have 90 percent or more of their worldwide income taxable in Norway and simply offer a system of proportionate personal deductions to all non-resident EEA pensioners based on how much the pension taxable in Norway constitutes the pensioner’s worldwide income. That would result in higher taxation for most EEA pensioners (mostly Norwegian nationals) and more burdensome documentation requirements for them. 63. The Authority notes, however, that the arguments concerning administrative difficulties potentially arising in an EEA EFTA State due to the implementation of the requirements of EEA law cannot justify non-compliance with a fundamental freedom35. 64. Further, the current infringement proceedings do not require the abolition of the withholding tax for pensioners. They, moreover, do not in any way concern pensioners residing abroad who receive 90 percent or more of their taxable income from Norway. Rather, the proceedings are aimed at bringing the relevant Norwegian laws into line with the requirements under the EEA Agreement, i. e. that certain residents and nonresidents receiving pensions in comparable circumstances from a fiscal point of view, should be treated equally. 65. Finally, it has to be noted that according to the case law of the Court of Justice it falls to the EEA State of residence not only to take into account the personal and family 34 See, by analogy, Case E-1/04 Fokus Bank  EFTA Court Rep. 11, paragraph 31. 35 See, to that effect, judgment of 11 December 2014, Commission v Spain, C-678/11, EU:C:2014:2434, paragraph 61 and the case law cited therein. See also, to this effect, Case E-19/14 ESA v Norway  EFTA Ct. Rep. 300, paragraph 48.
circumstances of the resident taxpayer, but also to ensure that the taxpayer is granted 100 % of allowances and not just the portion calculated according to the pro rata principle36. 66. The same is true as regards the obligations of the EEA State of the source in the situations where EEA law requires this State to ensure equal treatment of non-residents with its residents, such as the situation discussed in the current infringement proceedings. In the view of the Authority, in this respect, this situation differs from the cases, such as examined by the Court of Justice in the judgment of 9 February 2017, X, C-283/1537, where the income is received in several States, but not in the EEA State of residence. It follows from all the foregoing that, by excluding non-resident pensioners, with the exception of those who receive the whole or almost the whole income from Norwegian sources, from benefiting from the deductions and limitations available to Norwegian residents, such as the deductions and limitations referred to in Sections 6-30 to 6-32, 6-40, 15-4, 16-1 and 17-1 of the Tax Act, where, because of the modest amount of their pensions, they are not taxable in the EEA State of residence under the tax legislation of that State, Norway has failed to fulfil its obligations arising from Article 28 EEA. that, by excluding non-resident pensioners, with the exception of those who receive the whole or almost the whole income from Norwegian sources, from benefiting from the deductions and limitations available to Norwegian residents, such as the deductions and limitations referred to in Sections 6-30 to 6-32, 6-40, 15-4, 16-1 and 17-1 of the Tax Act, where, because of the modest amount of their pensions, they are not taxable in the EEA State of residence under the tax legislation of that State, Norway has failed to fulfil its obligations arising from Article 28 EEA. Pursuant to the second paragraph of Article 31 of the Agreement between the EFTA States on the Establishment of a Surveillance Authority and a Court of Justice, the EFTA Surveillance Authority requires Norway to take the measures necessary to comply with this reasoned opinion within two months of its receipt. For the EFTA Surveillance Authority 36 Judgments of 12 December 2002, de Groot, C-385/00, EU:C:2002:750, paragraph 110; and of 12 December 2013, Imfeld and Garcet, C-303/12, EU:C:2013:822, paragraph 43 and the case law cited therein. 37 Judgment of 9 February 2017, X, C-283/15, EU:C:2017:102. This document has been electronically signed by Frank J. Buechel, Carsten Zatschler. Naa er det sandelig paa tide vaar regjering ordner opp i denne ulovligheten og foelger EFTA´s avtalte lovverk og ikke oppfoere seg som et bortskjemt, rikt HARRY land. Mange av vaare daarligere stilte utenlandsboende pensjonister har sloss for denne ulovlige, urettferdige kildeskatten siden dens innfoering i 2010, og mange har i mellomtiden ´gaatt bort´uten aa ha sett rettferdighet skje fyldest. Dette er helt uverdig for et land som Norge og representerer et ´trass system´, vedlikeholdt av visse personer i embedsverket som ikke vil gi seg. "Klippe klippe, sa kjerringa". Aarsaken er en uheldig utvikling i embedsverket, hvor enkelte ledere , etter aa ha sittet i samme stilling for lenge, inntar en ´herskerposisjon´ , som tolker vaare lover paa sin EGEN maate. Det har ogsaa utviklet seg et uheldig ´kameraderi´ mellom personer i vaart embedsverk og medlemmer av ESA som skal ivareta at alle medlemmer foelger avtalt lovverk, hvor det foregaar hyppige telefonsamtaler paa ´DU´ basis. Dette er en lovstridig og uheldig praksis.